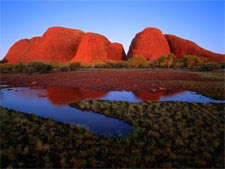 The group decided that in order to get the best of Australia, we should visit as well its aboriginal sight. The so-called Outback area of Australia is very mixed in terms of cultural significance and its land. One area that stands up is the Uluru-Kata Tjuta, which we had to drive to the National Park that bares the same name. it came in handy that we pick the SUV cause the terrain was varied and rocky, at several times we had to turn the 4-wheel drive suspension ON so we can escape several uneven roads. Once we arrive, we were greeted by one of the members of the Anangu tribe, he was extremely friendly and we were surprise to learn a lot about his culture. The Anangu tribe are the owners of this portion of the land where this incredible landscape resides. We were tire, cause the drive is hard and incredibly long cause the roads are crazily made. It was a good thing to bring the GPS cause otherwise we would have been lost! The next morning we set our goal to see the sound and sights of this incredible land. It is totally different from the city, but it holds its own beauty. We discover that the name comes from two rock formations. The Uluru where the monolith stands is the most recognizable of all formations here in Australia. It is impressive how this thing came to be. Around its edges are carvings and incredible pictures that are a testament of the rich history of the aboriginal tribes here in Australia. Our guide told us to call him Roger, cause he said that our tongues will cracked if we tried to say his aboriginal name. we laughed and told him to try us. Trust me, the girls’ eyes bulged and the guys and I were open mouth. We said in unison “soooo, Roger would be!” and we all laugh! Roger was amazing and shows us the different stories and folk tales of this long forgotten time. Then we head to the other side which is the Kata Tjuta is the name that in aborigine means “many heads” and we all can see why they named that rock formation that way cause its around 36 round or box-y peaks all standing side by side to each other in a round way. Roger said that it dated 500-millions years back, and that from many times before it was used by the tribesman as a kinda initiation to the younglings as a sort of passage to adulthood. Once reaching to that point, you can see many differences with both areas, specially the flora. Both places holds considerable amount of power to the people in this area. Either Religious or Tradition, these two places spells a mystical force-field around the Anangu-s. the ancestors of this tribe with its unique history and traditions melts with the new offspring with the new and technology. We were really impressed and certainly another sight of Australia that we’ll be in our memories! We then travel back to Sydney where we stayed there for another night to then take the flight back home. It was an amazing and incredible trip. Full of surprises and mystery and seeing a different Australia than say the usual “crocodile hunter” or “Outback Restaurant” sights, if you know what I mean. We had fun and it came in handy that we rented out a SUV cause we stopped at our leisure and took incredible pictures and created new memories. Another plus is that the gang and I had wonderful fun and a total blast!